Bamboo sunglasses and hybrid cars are just a couple of the countless curiosities designed to assist humans in living more natural, environmentally-friendly lifestyles. But perhaps all of them are outweighed by one of the latest trends gripping the “Green” movement: urban rooftop farming. 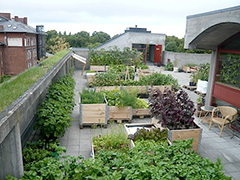 Derived from the green-roof movement, which saw building owners begin to cover rooftops completely with plants, flowers, and other vegetation for the purposes of insulation, stopping runoff, or simple aesthetic value, rooftop farming literally vaults those trends to a whole new level, with participants growing and cultivating full-blown sustainable farms on top of city buildings. Fruits and vegetables grown on rooftop farms are typically sold at local markets or to nearby restaurants, providing livelihood for the surrounding communities. Brooklyn Grange, the largest rooftop farm in existence, even sports a few chicken coops and more than 30 beehives, all contained in a 2.5 acre area on top of several Brooklyn buildings. New York City even provides grants, tax abatements, and other incentives to rooftop farmers. But New York is not the only place where the sky-high farms flourish. Chicago and Boston are also known for catering to green rooftops, with Chicago laying claim to some of the earliest purveyors of the trend. In addition, farmers around Fukishima in Japan started to grow on rooftops after the 2011 tsunami rendered much of the nearby land unfit for crop growth. To top things off, green-roof guru Will Allen is lifting the movement to new heights in Milwaukee, where development of his five-story vertical farm is underway. He hopes the project will pave the way for a 100-story farm in the not-too-distant future. Things are certainly looking up for the rooftop farming movement. Posted on May 7th under Global Ecology.